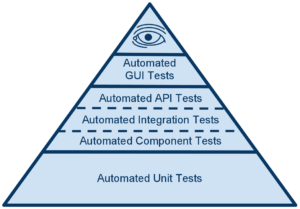 Automated unit tests are the backbone of the testing pyramid. Unit tests enable us to solve bugs using a test driven development strategy. They express both intent and usage and will become more valuable by time. Unit tests are the base of the testing pyramid! All projects are written in .NET Core / C#. Every project has a matching unit test project. Unit tests are written in Xunit. Asserts are expressed as Fluent Assertions. The CI script runs in a microsoft/aspnetcore-build:2.0.0 Docker container. Unit tests are part of the script: restore, build, test, publish, pack, persist. Divide the pipeline into clear steps with output like “Step 4/9: Testing”. Restore and build once. 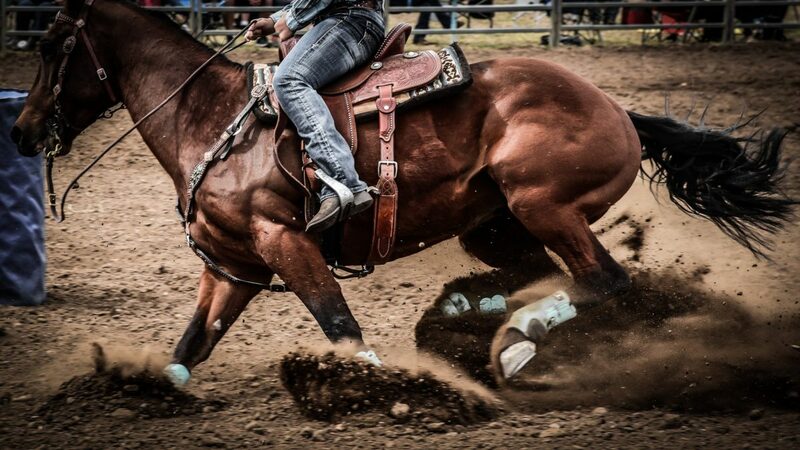 This speeds up the process and prevents extra logging. Terminate on failure with a clear reason. Now imagine if you have 9 of these projects. Imagine you don’t have color-coded logs. Don’t show the error stream, the standard stream has enough information. 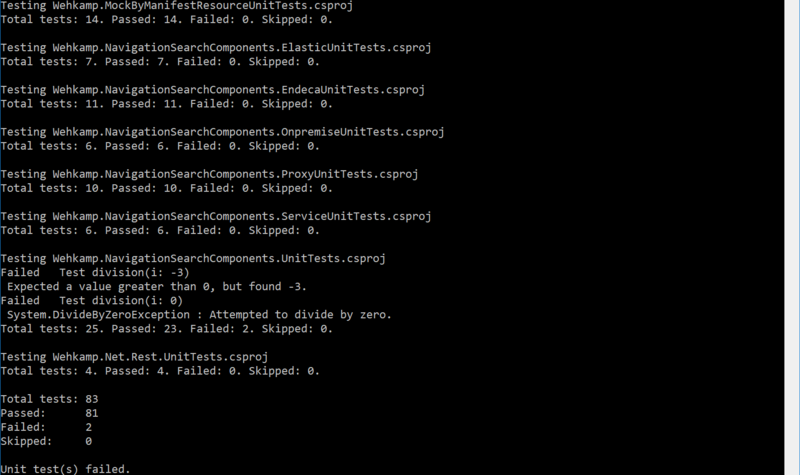 Show lines that start with Failed, because they contains the name of the failed test. Show lines that start with Total, because they contains a summary of all the tests. Show lines that contain the word Expect, because they contain the reason the unit test is failing. Show lines that contain the word Exception, because they contain exception information. Note that the information is both compact and relevant. Let’s take a look at the CI/CD implementation. In most pipelines a restore and build is done before the test is started. 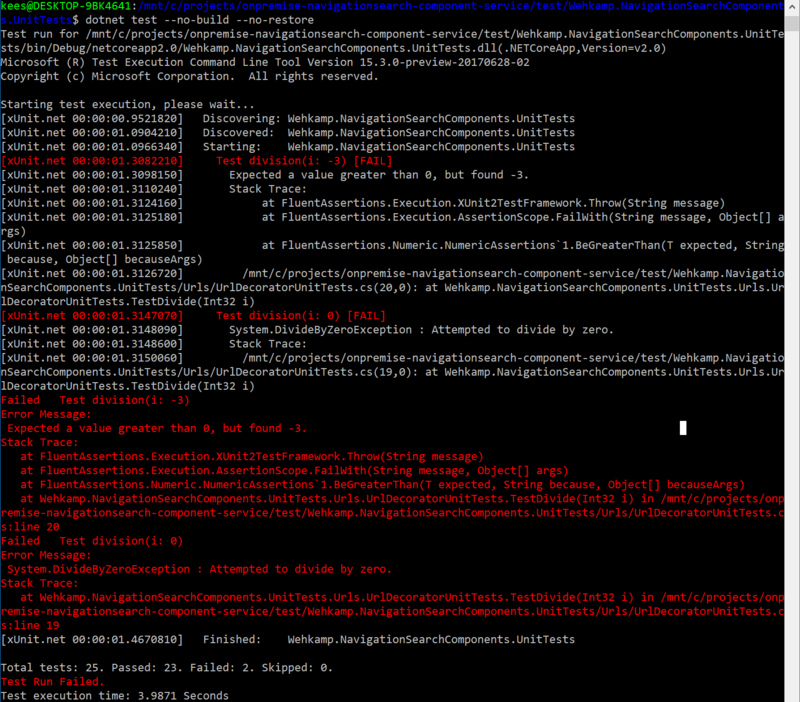 To speed things up, I like to test the release binaries that were generated by the previous steps. Just add -c Release to the test runner command. I also want to output the name of the project before testing it. And I like to have a summary at the end of the test step. So there you have it. Turn off the noise; be more effective. Note: the screenshots are taken from bash on Windows. I don’t use Linux to develop, only to do CI/CD. Installing bash on Windows will help to debug your CI/CD scripts.